would have started his education here. Harry was born in Newbury in 1887, the son of Samuel Maccabee and his wife Elizabeth née Haines, and was christened Harry Haines Maccabee at St Nicolas’ Church on 16 August. They had seven children in total: Mary Leonora (born 1878), William (1882), Beatrice Ellen (1884), Harry (1887), John (1892), Ethel (1894), Eva Bessie (1897) and Edward Tom (1901). 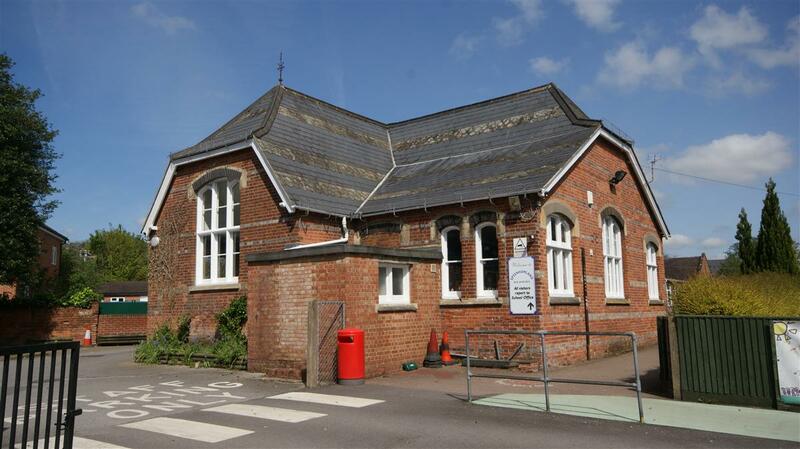 The children were educated at Speenhamland School, learning the basic skills of reading, writing and arithmetic plus some geography, history, grammar and English literature (plus needlework for the girls). Samuel was a painter/decorator and the family lived in Shaw Fields – generally considered a part of Newbury but, in fact, neither in Newbury or, as the name suggests, Shaw, but in the parish of Cold Ash. Since that time it has been incorporated into Newbury and is part of the area known as Turnpike. His schooling would have ended at the age of 13 after which he would have found work, but there is no record of this employment. Inquest report in the Nebwury Weekly News. 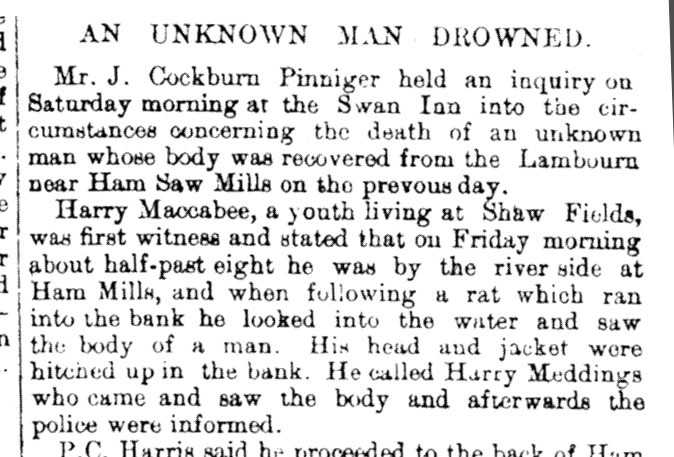 On 8 January 1904 the 16 year-old Harry was involved in some local excitement when he discovered a body in the River Lambourn near Ham Mills. The body, which was believed to have been in the water for as long as a month, was never identified. The parapet on the bridge carrying the London Road over the Lambourn was noted to be too low after the path had been recently raised, making it more of a danger than a safety feature. Soon after, on 12 February 1904, young Harry (5ft 3in tall, fresh complexion, blue eyes, brown hair) enlisted into the Royal Berkshire Regiment. On enlistment he claimed to be aged 17 years 6 months but at a later date his attestment form was altered to change his ‘apparent age’ to his actual age of 16 years 6 months. At either of these ages he would have joined as a drummer boy or similar until he was 18 and could sign on as an adult – which he obviously did since the 1911 census found him in India, serving with the 2nd Battalion of the regiment. By the time war broke out in 1914 Harry had left the army after serving seven years beyond his eighteenth birthday (the one he gave the army) with the colours. However, he remained a member of the Army Reserve for a further five years. On 5 August 1914 the Reserve was mobilised to supplement the Regular troops in UK based battalions, many of which were preparing to go to France with the British Expeditionary Force (BEF). Harry’s old battalion was still in India so he was sent to join the 1st Battalion, Royal Berkshire Regiment, then stationed at Aldershot. Harry responded quickly to the call, he was among the first 138 fit reservists to join the battalion by 6 August - the only reservists to cross to France with the battalion overnight on 12/13 August. More would soon follow. The battalion was one of four in the 6th Brigade, 2nd Division, I Corps and hence was under the command of Lt General Sir Douglas Haig who commanded I Corps one of the two Corps that made up the British Expeditionary Force under Field Marshall Sir John French. The 2nd Battalion returned from India and became a part of 25th Brigade, 8th Division, which landed in France on 5 November 1914, in the middle of the 1st Battle of Ypres. At some point Harry switched from the 1st Battalion to his old battalion; such changes usually came about as a result of a break in service – often caused by sickness or wounds, both of which were commonplace in war time. On the morning of 4th March the Battalion formed the Right Flank of the Assaulting Force, and attacked PALLAS and FRITZ trenches. For the report of operations on 4th and 5th March see Appendix I attached. Casualties - killed 2 Lieut J.A. NEALON, 2 Lieut J.A. GRAY, 2 Lieut G.H. PARSONS and 43 O.R. Died from wounds - 11 O.R. Wounded - Captain A.A.H. HANBURY-SPARROW DSO, T/Captain W.B. SCOBELL, Lieut B. HAYE, 2 Lieut H.S. GUNSON, 2 Lieut E.G. FAULKNER-SMITH, 2 Lieut P.D. HARRISON and 173 O.R. Missing 20 O.R. on the ground Fritz trench was barely discernable. Many men advanced into Bremen Trench before realising their mistake. (click map for enlarged view). 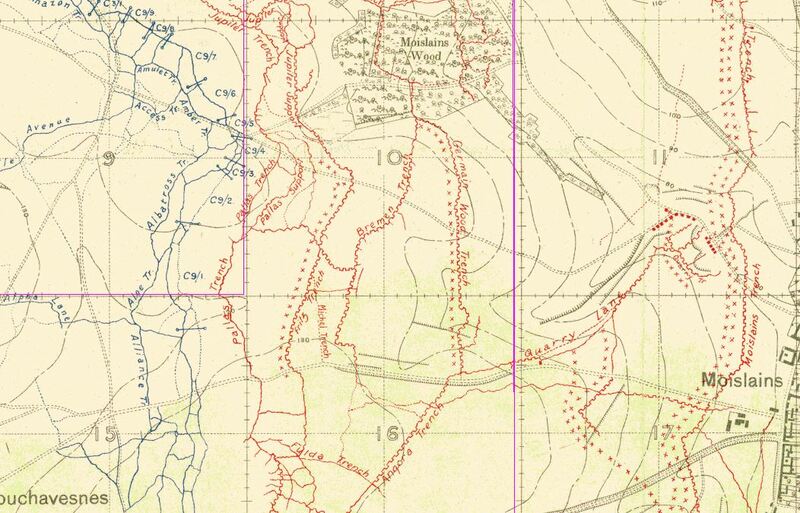 The trenches were undefended (the Germans were already withdrawing troops from forward positions) so the Berkshire's set about turning Fritz Trench (which had been so damaged by shellfire that it was barely recognisable as a trench) into a defensible position - the Germans did not counter-attack as might have been expected, but a heavy barrage caused a large number of casualties caught virtually in the open. Among the ORs (Other Ranks) who were recorded as missing was Harry Maccabee. There was no response; Harry had died during the battle. His remains were never identified so he has no named grave. His name is remembered on Pier and Face 11 D of Lutyen’s immense Thiepval Memorial to the missing of the Somme. Locally Harry is remembered on tablet 2 of the Newbury Town War Memorial and the village memorial in Cold Ash. 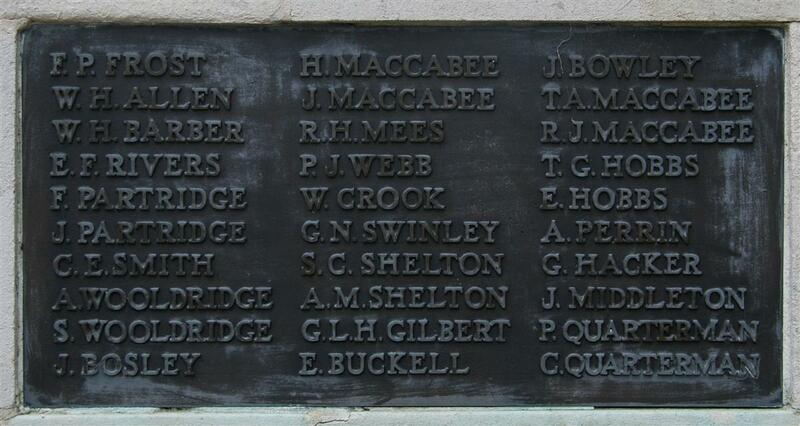 He was also among those names on the memorial tablet placed into his old school at Speenhamland. The Speenhamland School memorial also commemorates a John Maccabee, and the Newbury memorial a J Maccabee – these are believed to be Harry’s brother and to have been included in the mistaken belief that he had perished. However, there is also a possibility that ‘John’ was a mistake and it should have been James – Edwin James Maccabee (not a close relative) who died in Flanders in 1917 – for more on this mystery click here.